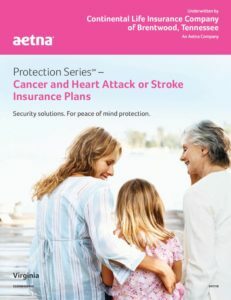 Senior Benefit Services, Inc. Aetna Cancer and Heart Attack or Stroke Plan Available Now in Virginia! - Senior Benefit Services, Inc.
Aetna Cancer and Heart Attack or Stroke Plan Available Now in Virginia! Did you know? You can now order sales materials for our new Cancer and Heart Attack or Stroke* product in Virginia and submit paper applications. Online enrollment with Aetna Quote & Enroll will be available for this product starting March 1, 2019. Cancer, heart attack, and stroke can happen at any time to anyone. Even those who live a healthy lifestyle run the risk of being diagnosed with one or more of these illnesses. No one likes to think about the possibilities, but the risks are very real. This insurance can help your client manage expenses and their savings can be preserved. Your client may have more freedom in treating their illness, without worrying about expenses.